In September, 2011, The Cleanest Line reported the demise of two dams on the Elwha River in Washington State. Currently the largest dam removal project on the continent, the demolition of the 108-foot Elwha Dam and the 210-foot Glines Canyon Dam will allow five species of Pacific salmon – including a super strain of Chinook salmon topping 100 pounds – to access more than 70 miles of previously unavailable waterways. Salmon currently spawn in five miles of river below the Elwha Dam, which provides no fish passage. Dam busting is a hot commodity on both the left and right coasts of North America. On December 17, 2010, the Penobscot River Restoration Trust – a joint venture between American Rivers, the Atlantic Salmon Federation, Maine Audubon, the Natural Resources Council of Maine, the Nature Conservancy, the Penobscot Indian Nation, and Trout Unlimited – purchased the Veazie, Howland and Great Works Dams on the Penobscot River in Maine at a cost of 25 million dollars. Phase Two of the Penobscot River Restoration Project begins with the removal of the Great Works Dam in 2012 and the removal of the Veazie Dam over a two-year period beginning in 2013. Construction of a fish bypass at Howland Dam runs concurrently with dam removal. The estimated cost to implement this phase of the project is 30 million dollars. The Penobscot is the largest river in Maine and the second largest in New England, draining an area of 8,570 square miles. From its source in the highlands along the Canadian border, the Penobscot slips beneath the shadow of Mount Katahdin (5,268 feet) and covers a distance of 240 miles before discharging into Penobscot Bay at Bucksport. Since the last ice age, the Penobscot Indian Nation (traditionally know as the Penawahpskewi) has flourished along its banks, harvesting Atlantic salmon, shad, sturgeon, alewives and American eel from the river and its tributaries. Dam removal on the Penobscot has the potential to restore self-sustaining populations of 11 species of anadromous (sea-run) fish: alewife, American eel, American shad, Atlantic salmon, Atlantic sturgeon, blueback herring, rainbow smelt, sea lamprey, shortnose sturgeon, striped bass and tom cod. As the largest and most extensive watershed north of the Connecticut River, the restoration of the Penobscot is a critical opportunity for these native species. The success of the project determines in great measure whether or not they survive within our borders. Eighty percent of the remaining population of Atlantic salmon in the United States returns to the Penobscot River. Fewer than 300 wild salmon return to all other rivers within Maine, the last refuge for Atlantic salmon in the United States. This marquis species – the only salmon indigenous to the East Coast – teeters at the edge of extinction within our borders, surviving only through the heroic cooperation of government and non-government organizations. Individual populations of Atlantic salmon are now extinct in many rivers flowing from New Brunswick and Nova Scotia into the Bay of Fundy in Canada. The survival of Atlantic salmon in rivers south of the Bay of Fundy is not a biological anomaly, rather a reflection on the prolific potential of the Penobscot as a final stronghold for the species at the southern limit of their current range. The Penobscot River Restoration Project, when fully implemented, will restore access to 1,000 miles of historic habitat for Atlantic salmon and 100 percent of historic habitat for multiple species including Atlantic and shortnose sturgeon. Habitat loss – whether wolverines, grizzly bears, songbirds or salmon – is the most acute factor affecting any species in decline. Patagonia has consistently explored this theme through previous environmental campaigns (see Oceans as Wilderness and Freedom to Roam). By providing unfettered access between rivers and oceans for a multitude of species, dam removal is an elegant fusion of these initiatives. Stay tuned to The Cleanest Line and the Environmentalism section of Patagonia.com for the future updates on Our Common Waters. To learn more about the Penobscot River Restoration Project or to donate funds, please visit www.penobscotriver.org or www.asf.ca. 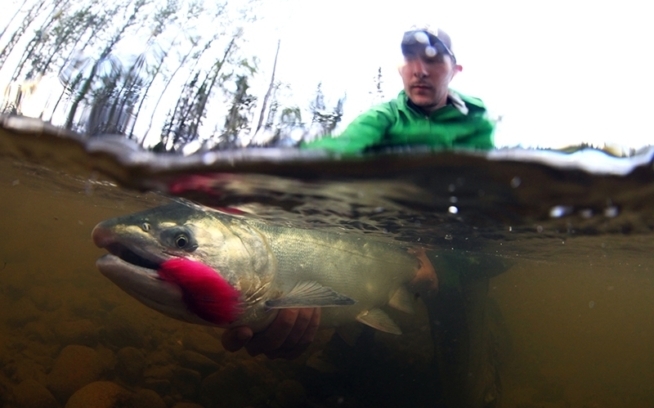 Topher Browne is a Patagonia Fly Fishing Ambassador. His first book, Atlantic Salmon Magic (2011), is available from Wild River Press.